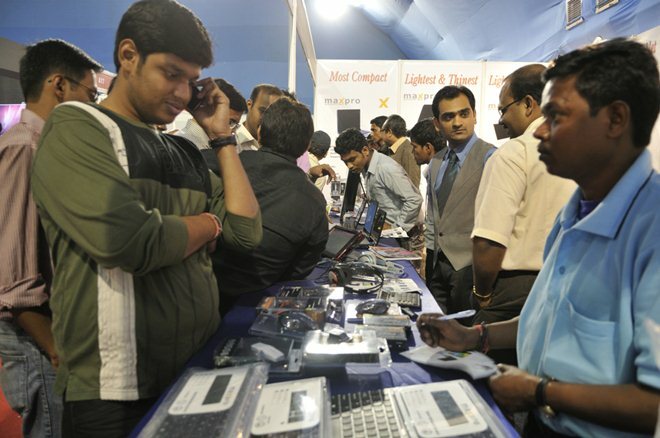 India’s smartphone market is showing significant potential, according to data from CyberMedia Research, which concludes that 2011 saw record shipments and sales in the country. During the first eleven months of last year, smartphone shipments passed the 10 million mark for the first time, to account for 6 percent of the near 166 million shipments made. It isn’t just the increase in anticipated demand that is on the rise, as smartphone sales topped one million per month for three consecutive months, September through October, which is another first in the country. 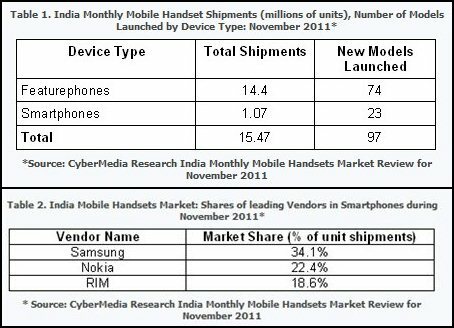 However, with more than 15 million devices sold during November, smartphones remain a niche part of India’s mobile market. It is Samsung that is best placed to take advantage of the space’s potential, as it reportedly scooped 34.1 percent of November’s smartphones sales, ahead of Nokia (22.4 percent) and RIM (18.6 percent). The data does not take into account sales of Nokia’s Windows Phone 7-based Lumia devices, though, as they were launched in India towards the end of November. It remains to be seen whether the devices, which were designed with India in mind, can claw Nokia back ahead of Samsung in India. Increased installed base of smartphones and greater operator focus on arresting declining ARPUs set stage for rise in share of revenues from data services in 2012 and beyond. Equally 3G devices, which accounted for 8.9 percent of measured shipments, are set for a big part in the future of mobile in India, although lead analyst Naveen Mishra admits that “the user experience on 3G networks [is currently] constrained due to network quality issues”. One final notable point from the data is the popularity of multi-SIM handsets, which accounted for 54 percent of total mobile shipments. Nokia leads this segment too, as its seven models hold a 19 percent shipment share.